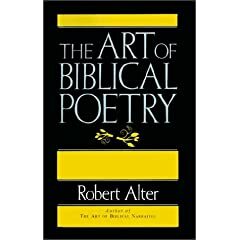 As per request, a brief shout out for Robert Alter’s companion book to his popular and well-received The Art of Biblical Narrative (BTW – I also recommend reading this book before 2nd year. So does Reuben, and also Chris). This volume is differently structured than his previous. Whereas in the first volume a chapter is devoted to some device or structure or feature or such, here, the first three chapters outline the basics of how Biblical poetry works, and the rest are essentially an extended series of worked examples covering most of the extant genres of Biblical poetry. You’ll get the basic idea with those three chapters, but those worked examples are where the real payoff lies. I heartily recommend this book. With Psalms coming up in second semester, this will probably be as useful as the other volume. This entry was posted on Saturday, December 19th, 2009 at 1:18 pm	and is filed under Reviews. You can follow any responses to this entry through the RSS 2.0 feed. Both comments and pings are currently closed.